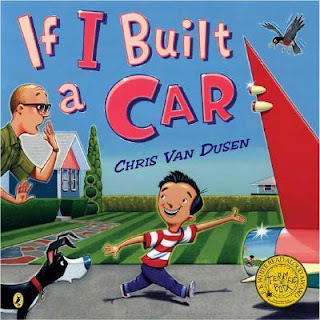 One of my favorite children's authors and illustrators is Chris Van Dusen. His illustrations are packed with a lot of wonderful detail and his writing is quite sharp and entertaining. I highly recommend his books. They are a treat, even if you aren't a kid! 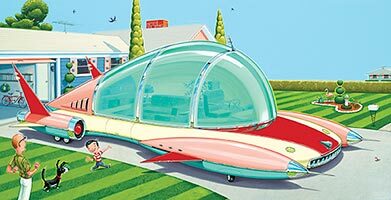 A couple years back I read his book, If I Built a Car, to my 3rd grade classes. After sharing the book and the illustrations with my digital presenter, I modeled using diagonal lines to make flat shapes into 3d shapes. We also went over pressing softly with their drawing tools to make the tops of things lighter because the sun was hitting those areas more than the sides. Before starting on their big drawings, students did some guided practice with me and then some independent planning on various cars or ideas they had in mind. The kids had a ball with this one. They really put on their inventor hats and came up with some pretty cool vehicles. I also had them add a window or two in the corners to show the car from the front, or to show some interior detail we couldn't see in the bigger drawing. I need to revisit his work with my classes again. I found a couple writing prompts for grades k-2 and 3-5 here. Could be a good pre or post activity when doing this project in the future. Thanks again for writing and please give my best to your students.